I'll keep this short and sweet: this is one of my all time favorite recipes. 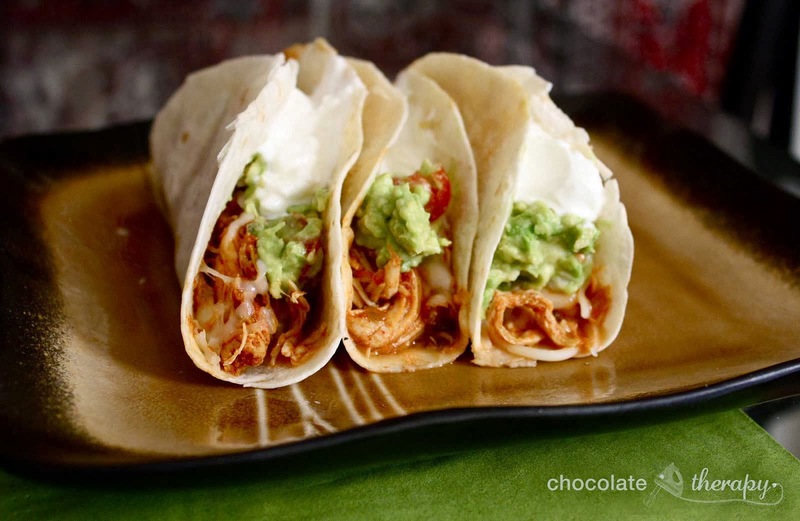 If there is one crockpot recipe you need in your repertoire, this is it. But truthfully, after making it once you won't even need the recipe because it's just so darn easy. Three ingredients and almost zero work. 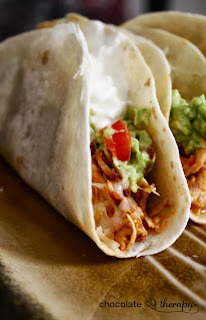 The result is a juicy, flavorful shredded chicken that makes some killer tacos. I like to load up my tacos, so they look a bit messy in the pictures. They were like that in real life, too. Messy and delicious. I've been told before I have a knack for ordering the messiest foods on any menu. Why? Because the messiest foods are the best foods. It's a fact. You can easily put together a great tortilla soup with the leftovers from the chicken. I've included the recipe at the bottom of this post. If you read through the comments you'll also see a number of great reader suggestions for ways to adapt the recipe. My favorite twist is to add a block of cream cheese about 15 minutes before the chicken is served. I didn't think this recipe could get any better until I made them and tried this out. Amazing. I've also seen that adding a can of cream of mushroom soup when you throw in the ingredients is delicious. I'll be trying that next time! **As a side note, I am SO grateful to everyone who has made this recipe and/or commented on the post. I may not be able to respond to all of the comments, but I read every one, and I absolutely love them! I can't tell you how happy it makes me that people are enjoying the recipe so much. Thank you, thank you, thank you! 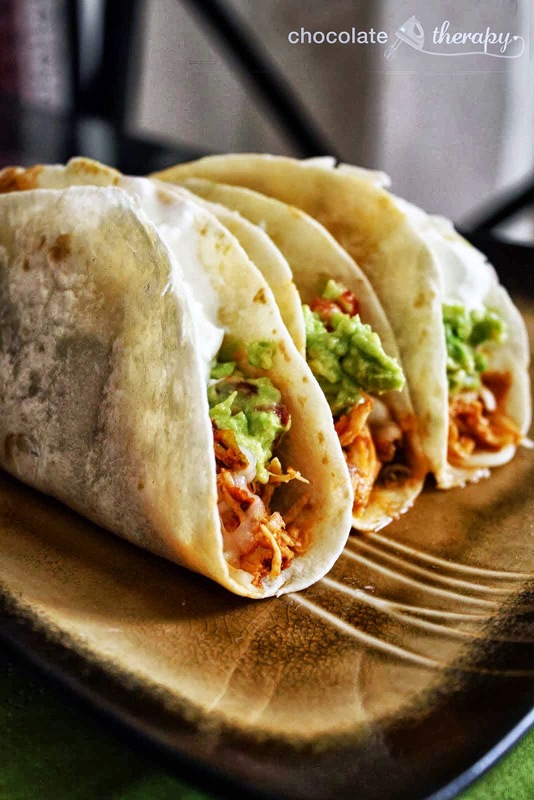 For tacos, serve the chicken with soft flour tortillas, guacamole, lettuce, shredded cheese and/or sour cream. This is very versatile and can be used for enchiladas, nachos, tostadas, quesadillas, etc. Any leftover chicken can then be used for tortilla soup (make it the next day or freeze the chicken to use at a later time). When I don't want quite as much food I cut the recipe in half. You don't have to get too exact about the measurements. I use three or four chicken breasts--whatever comes in the smaller package at the grocery store--and use between half and 3/4 of the amount of salsa and taco seasoning called for in the full recipe. The only result of using too much salsa for the amount of chicken you use is that it will have more liquid when it's done. The flavor will be the same. Pour out a little of the liquid when the chicken is cooked and you're good to go! *I use Old El Paso Reduced Sodium for the seasoning. For the salsa I switch between brands, but Newman's Own and Pace are my favorites. Trader Joe's Mango Salsa and other kinds with mango and peach flavors are delicious in this recipe as well. If you want to avoid using processed ingredients you can make this recipe using homemade salsa and homemade taco seasoning and achieve the same results with the added bonus of skipping out on the preservatives and such in pre-packaged ingredients. Here is the tortilla soup recipe from one of the readers. Thanks, Cissy! Dump everything in a pot and simmer for ~30 minutes. Garnish with cheese and crispy tortilla strips! Oh wow, cream of mushroom soup?! I am absolutely going to add that next time! When you add the CoM, do you add any water? Cans contain BPA - avoid them if you can. Bad chemicals your family doesn't need. I add a block of cream cheese rather than the soup. Yummy!! Hope you have a chance to try it! Best tacos ever! I saw this on tasty kitchen and was wondering if it was good. I will have to try it. I had my doubts the first time I made it because I thought it was almost too simple, but those two seasonings somehow do the trick! Do you think the same thing could be done with beef? I've been trying to find a simple recipe for crock-pot shredded beef tacos. I'm not sure, but I don't see why it wouldn't. I think there would be a few differences in cooking time, but I'm sure a quick Google search would point you in the right direction. Let me know if you give it a try! I make shredded beef tacos all the time in my crock pot. I buy either top sirloin or London broil, which ever is cheaper, put it in the crock pot on high for about 6 hours. Add salt and pepper in the end and then shred. It is so flavorful and moist. I add NO water and it is delicious. It is my husbands favorite. I LOVE my crock pot and it is great for the weekends so we can go, go, go....then come home for a yummy family meal together! here is a recipe... chuck roast (cheap), taco seasoning packet, and a can of diced, stewed, or whole tomatoes... cook on low all day. Shred with 2 forks. SO YUMMY!! Sorry, crock pot newbie, but can the chicken be frozen? I was looking for this exact question. Thanks Rigina and Anonymous! I have done some research on putting frozen meat in the crock pot and I have found that it can be un-safe due to the way some crock pots heat. I put frozen meat in the crockpot all the time. I think it makes the meat moisture. Yes, Rigina. I put in frozen, skinless chicken breasts and a jar of store brand salsa in whatever flavor suits you (chipotle, southwest style, mild, medium, hot...really, WHATEVER kind), turn on the crock pot and walk away. It's not dried out and shreds effortlessly. After I pick out the cooked from the crock pot, I toss the salsa...although, I have no idea why I do that. I think I'll add taco seasonings next time and maybe even cream of mushroom soup, like someone suggested. Oops! I meant to say "After I pick out the cooked chicken from the crock pot,..." And, also, when I said "I toss the salsa..." , I meant that I toss it down the garbage disposal. Be sure to turn on pot after it is loaded. Having children, I can be interrupted from what I'm doing. I put frozen meat in a hot pot and busted it. Oops! What's a good salsa to use? I completely agree that Newman's is the best salsa, I especially love their garden vegetable for chips and dip. For this recipe I usually just buy whatever is decent and on sale, which the past few times has been Pace. Add can reffried beans to it. Wow - I wish I had more words to say....but all that comes to mind is - YUM! OMG! YUM! I want some of these now YUM! Thanks, Ann! It's hard to beat a taco loaded up with all of the best fixings. Trust me, this recipe is a keeper! I do the same thing with cream of mushroom soup! If you add cream of mushroom soup, do you omit the taco seasoning? I found this on PInterest and looks amazing! Making it this week and giving this recipe to everyone I know! Thanks for the recipe Sarah!! I am going to make it this weekend. I hate cooking but this sounds fun! (because it's easy) ha ha. Do you have a good tortilla soup recipe? If so, will you send it to me? Or post a link? I've been wanting to try one. Here is the tortilla soup recipe for leftovers from this chicken. It's a good, easy recipe, but I'm guessing there are better ones out there. I like a bit of a creamier broth, but with that you get all the calories of heavy cream. Dump everything in a pot and simmer for about 30 minutes. Garnish with crumbled tortilla chips and shredded cheese (Mexican blend). i dont have to cut up the chicken before i put it in the crockpot? or put it in whole?! ok thank you! i got mine in my crockpot right now, cant wait to eat. Great! Hope it turns out well! I make this with the spicy Rotelle tomatoes instead of salsa. You can also add black beans and/or frozen corn. Makes the BEST chicken tacos ever! I love getting suggestions for ways to change up the recipe. So far I've heard cream of mushroom soup and then rotelle and black beans/corn. Both sound amazing! I'll definitely be trying that next time. I am just cooking for 2 people. If I use 3 chicken breasts, should I use 1/2 package of taco seasoning and 1/2 jar of salsa? Or does it not matter? Can't wait to try this tomorrow! Yep! That's actually what I usually do. I'm sure you could cut down on the salsa and seasoning, especially if you had some chips or something you wanted to use the rest of the salsa for, I just never have. Or make the full batch and freeze half of it for another day. I do that when I make carnitas because it makes so darn much. Goes into enchiladas or quesadillas for an easy meal thats already half done! I'm trying your chicken recipe tomorrow after finding it on Pinterest and hearing a rave review from a friend. Thanks for sharing. Kristina, I'd love to have your recipe for tortilla soup. I like the one I have, but I can see it easily being topped! And I will have to try freezing half the batch - great idea. What do you mean by 6 pieces of chicken breast? 6 whole chicken breasts, or 6 pieces of a chicken breast? 6 boneless, skinless chicken breasts. They don't need to be cut up. I'm so glad that your family loved it, and that's great that you managed to stretch it across multiple courses! I don't know why I never thought to put it in a quesadilla. What an amazingly delicious idea! I want to make these tomorrow I see that my chicken can be frozen. So do I do it on high and for how long? I used 3 larger frozen chicken breasts, one can mild rotel & package of taco seasoning. Cooked on low for 7 hours and they were great! Probably would have been fine. At even 6 hrs. I made this dish tonight for my fiancé and I. It was de-lish! I decided to wrap it like a burrito instead so it wouldn't be so messy to eat. I also added a can of black beans towards the end of cooking and we ate it with homemade guacamole as well. Thank you Sarah, this recipe will be used by us for years to come! Thanks, Trisha! What a wonderful compliment. Those are my favorite recipes - the ones you immediately know will become staples. And I will definitely have to try making it into a burrito to save myself a few napkins. What is the best kind of sauce? would picante work? I really love this with a refrigerated pico de gallo either blended so it's more liquid-y or just dump the whole thing in. When you ladies add the cream of mushroom soup do you omit any other ingredients? Looked so good! I opened a can of chicken added salsa and 1/2 taco seasoning but also threw in some yellow cheese & mozzarella. Mixed it up and put it on the flour tortilla in the quesadilla maker! awesome!!! I do this same recipe but throw a can of black beans and corn on top of it in crock pot and it is amazing! I do something similar... taco seasoning and 2 cans of Ro-tel tomatoes and chiles... To die for. I work in a residence for folks with severe mental illness, and on weekends I like to make a communal "house lunch". I think this will fit the bill! I plan to make it and then serve with black beans as a "Burrito Bowl" a la Chirpotles Grill.. easier for my clients than actually making the tacos.. and I'll serve warmed tortillas on the side..
What a great thing to make it for. And everyone loves to assemble their own tacos (not to mention the work it saves for you). Hope it's a hit! Do I just dump the seasoning or should I mix it according to the directions and then dump it? Just dump it in and stir it around to make sure it's evenly distributed. i made this recipe last night and i absolutely love them!!! im obsessed and am eating the left overs right now!!! ill never go back to hamburg again for tacos, these are amazing!!! Success! Come to think of it, I haven't made regular beef tacos since I've been making this recipe either. Guess that says something that I haven't missed them one bit! I make this all the time except I throw in a brick of cream cheese about 15 minutes before we're ready to eat and it makes it really creamy. Everything is better with cream cheese. I'll have to try that variation! Sarah is it ok to share your recipe with others?? Of course! I wish I could take credit for coming up with the recipe, but I found it from someone else as well. Regardless I would love for you to pass it along! This probable a stupid question but when you say 6 pieces of chicken do you mean 6 chicken breasts and do you need to cut them up? It's 6 breast halves like you would find in a boneless skinless breast package at the market. You don't cut it before. Just throw it in there frozen or fresh. Makes it much easier to shred when it's done. This looks wonderful. I'm going to make it right now. I'm adding cream of celery soup, and corn. I also hope to find some time to get the black beans and add them as well. Found you on Pinterest. This looks amazing! Will definitely be trying it soon! I do basically this, but on the stove with ground turkey. I love using a peach or a mango salsa for it. We tend to never get to the taco point and end up eating it out of the bowl with tortilla chips. You get the taco sauce flavoring from the seasoning packet, so I'd recommend just sticking with the salsa. I'd also think that the thicker consistency of the salsa was important to how it turned out, but I guess technically if you have at least a certain amount of liquid it wouldn't matter what kind it was! The tomatoes are what help break down the chicken for easy shredding. I accidentally made it with picante sauce and it wasn't as good. I am going to try with a whole fryer chicken, after removing the skin. Can't wait. Thanks for the recipe. Made it last night for my extended family and it was a hit with everyone; kiddos, my parents, everyone. Shredded chicken has never been a favorite of mine, but even I liked it. Also, when I find something like this that is easy and well received while also being nutritious I recommend it to my clients. I am a dietitian/nutritionist so I used low sodium taco seasoning and homemade salsa to cut out the added salt, then put reduced fat sour cream, reduced fat cheddar, fresh lettuce, avocado and diced tomatoes on the tacos. I also used 100% whole wheat tortillas from a local bakery. A perfectly nutritious, low fat, high fiber and protein meal that I threw together very easily and also tasted delicious. Can't beat that! I need to try it with those calorie/sodium cutbacks the next time I make it. I'm sure the flavor is almost exactly the same. I've also never thought of putting homemade salsa in it, what easy swaps! I have this in the crockpot right now. :-) My kind of recipe. Quick and easy. Thanks! Found you from a pinterest post. LOVE IT! So doing this THIS week! Thanks for finishing my menu planning! made this for dinner last night...THANK YOU! they were amazing! I have this in my crockpot right now. Found the recipie on pinterest. Thank you so much for sharing!!! Super easy and my house smells amazing!!! Trying this today or supper tonight... It has been in the crockpot for about 2 hours now and smells and looks awesome.. Thank you so so much...!!! Made these tonight, so easy and yummy, thanks! I made these tonight. I found the recipe on pinterest and it looked so good that I had to make it asap! The only thing I added was half a can of diced jalapenos for more of a kick. Otherwise it was like the chicken tacos from my favorite resturant! Thanks!! I made this tonight, and it was soooo yummy! My boyfriend says this is definitely a keeper! Thanks! I made this once and added a little water to clean out the salsa jar which made it extremely soup-like so I added 6 cups of water 3 tblspn of better than bullion chicken base, continued cooking in crock for abt 2 hrs on high and called it chicken salsa soup. Super Yummo! I am going grocery shopping on Thursday, this has been added to my list! What a cheap and easy recipe..I am a die hard recipe user!! Now, if I can get my husband to try it, he's not a big chicken fan, and like it? We will be set!! This one may be going in the AWESOME FILE my kids have!! THANK YOU!! An AWESOME file?! What a great idea. I hope it makes the cut! Saw this recipe on Pinterest at 10:35pm, hopped in the car for a quick grocery run, popping this in the crock pot in the morn! Can't wait to try it tomorrow night! This looks yummy...it is in my crockpot now!!!! Just got all the ingredients from the store and we will be trying this out tomorrow. Thanks for posting the recipe! Thanks, Beth! It really couldn't get any easier. Hence why it's definitely one of the most well-used recipes I have! Thanks, I have been looking for more crockpot recipes for my new slow cooker I got for Christmas! Tried it tonight - delicious! Thanks for sharing. Thanks, Jen! I'm usually not a fan of chicken as much either, but this recipe won me over too. I'm so glad you both enjoyed it. do you add water to the taco mix, or just put the powder taco mix in the crockpot? No water, just the mix! Does anyone know the calories of just the original recipe? This looks so yummy:) but I'm dieting so I have to watch my calories. Hi Christina, I know every crockpot cooks a bit differently. This recipe is good because you can easily tell when it's done (the chicken will shred easily) and the moisture from the salsa, in my experience, makes it harder to overcook the chicken. I'd go with what you've found from past experience with your crockpot! Mine is a bit different than the recipe as well. I am so excited about this recipe :)!!! thank you! This will save me so much time. I'm putting this on right now. I can't wait! could this be made with shredded chicken breast out of a can???? My daughter is sick and that is the only kind of chicken I have at the house...haven't been able to go to the grocery this week. Have everything else. If so would the cooking time in the crock pot be the same or less???? temperature the same or less??? Do I need to add water to the crock pot if using frozen chicken breasts? Going to try it this weekend!Thanks for the recipe! Thank you so very much for sharing this recipe with us! Like I said yesterday I was giving this one a try tonight. I must say these were AWESOME! I could hardly believe that something so simple could taste so delicious, but these sure do! I used frozen chicken breast and it worked just fine. My husband, son, daughter and myself were all amazed how yummy these were! I will definitely make these again! Thanks so very much! I'm so glad you all enjoyed it, Doreen! I was skeptical the first time I made it as well, and the next thing you know it was one of my favorite recipes. Happy to have helped give you an addition to your recipe box! I love this recipe and believe it or not, my favorite salsa for it is Walmart's white bean and corn salsa. It is only two dollars for a big jar and goes a long way since I'm cooking for 3 teenage sons! My kids think I am the best cook in the world when I make this and it takes 2 seconds to put together! I have no idea what the points would be like, but I saw someone comment that you can sub in low sodium seasoning and homemade salsa to save some calories (or some sort of other healthier salsa option). I think this would also still taste delicious if you made it bowl style without the tortilla and just put the toppings on from there. @Hallie......I am eating this right now and I made it with frozen chicken breasts and no you do not need to add water. The juices from the chicken and the salsa are enough. Sooooo freaking good!!! Sounds like this has been a success. As I am reading I see that people say they use Cream of mushroom, but do you omit any of the other ingredients? I really want to try to make this tomorrow. Is it better with Cream of mushroom or just the salsa? You mentioned it was one of your top 5 faves - just curious what are the other 4? This is a good one. Found via pinterest. Take care! That's a great question! I should do a post on that. I don't have all of my favorite recipes on here, but I can think of two that absolutely make the cut: pizza bread is something I make almost on a weekly basis (http://mychocolatetherapy.blogspot.com/2011/02/pizza-sticks.html), and this buffalo chicken dip is the best bcd you will ever try (http://mychocolatetherapy.blogspot.com/2010/02/buffalo-chicken-dip.html). I'll contemplate the others for the list! it says 6 pieces but can you give me how many pounds of chicken that is? Thank you, and I a running to the store right now, so we will be eating it for dinner today. You could so do the crock pot chicken, then layer in a bowl..cooked rice, pico de gallo, shredded chicken, sour cream, cheese. Cook the same as directions for Crockpot Chicken Tacos. This is the best chicken ever and you can use as is, or thicken with cream cheese, or sour cream or add most anything you want. I served it over rice and it was really yummy. I use this Southern Living recipe for beef: 1 beef roast, 2 envelopes fajita seasoning, 2 tablespoons white vinegar, 2 (4 oz) cans chooped green chilies. Rub seasoning on roast, put rest on top and cook 8-9 hrs on low. Shred and serve with all the fixins. My family loves it! I've seen a number of people ask about a simple recipe with beef -- this one sounds great! I can't wait to try it out. Made this for dinner tonight and thought my daughters were going to complain about having to eat it. My oldest is very picky, but when she tried these tacos she immediately asked for another one. I'm really impressed with this simple recipe. Thanks!!! I was so excited to find this I got up out of my chair, made sure I had all the ingredients and threw it in the crock pot right then! I can't wait to have this for dinner tonight! With 4 kids, a full time job and graduate school, I am VERY thankful for this recipe! I'm glad I could help give you one less thing to worry about after the end of what sounds like some very hectic days! I hope you all enjoyed it. I'm not a great cook, and I have just started trying to learn and experiment! I have this in my crock pot right now!!!! I hope that it turns out! I am also trying the cream cheese idea (my weakness)! Really good!!!! An I used the fresh salsa from SAMs ... Not only easy to cook but I also used crock pot liner an easy clean up also!!! Thank for the recipe keep th coming. Omit the Salsa and use Rotel, it is extremely AWESOME Chicken for Tacos, Enchiladas, Tostadas, Burritos, etc. I've never served it to a crowd, so I'm not entirely sure. Has anyone else counted out the number of heads it feeds? It makes a lot, so my guess would be at least 10-12. I initially wanted to.make tacos with this, but i have no sourcream, and I cannot eat tacks without sourcream. Therefore I'm going to use this for quesadillas..no.reason why I couldn't, right? I put sour cream on my quesadillas as well because I'm a sour cream fanatic, but this chicken works great for quesadillas with or without the sour cream. It's so flavorful you don't even need the extras. Try the 3 lb bag of frozen chicken breasts (or tenderloins if that's what you like) - a jar of salsa - throw it in when you leave for work. When you come home put some shredded hot pepper cheese on top and mix up some rice. Don't shred the chicken, and serve dinner! I just took about 3 minutes to put everything together in my crockpot and put it in the fridge to start in the morning. I can't wait!! I think this is the easiest meal I've ever made! I completely agree. It's funny because the hands on time is less than it would take you to warm up a can of soup! I made this for a "fiesta" dinner party. It was PERFECT for serving to a crowd. Just lined everything up buffet style. Everyone loved it! Very good. Used what I had on hand, Fajita mix, salsa and cream of chicken soup. Husband had his on a sub roll and I served with Taco fixings. Definitely will make again. That's exactly what I do! This is the perfect recipe for clearing out some freezer space. This is probably a really stupid question but I'm just learning how to cook and use my crockpot. You are saying its okay to use raw or frozen chicken? Made this tonight for dinner. I found it on Pinterest! Sooo good! Big hit with the whole family!! Made it tonight...easy, tasty, awesome! I used a boneless Pork roast! It was soooo good! This was fantastic!! We've already decided it will be making an appearance on our dinner table at least once a month! I'm making this for my roommates and a few friends...any idea how many servings this recipe makes?? I'd say it would make 10-12 depending on how much you put in the shells. Also depends on what kind of shells you use. I used hard shell tacos and it would probably make way more than that. I had enough to make 6 hard shell taco's plus 4 MONDO burritos the next night. Found you through a FB "share." Great idea!!! What size crockpot do you use? I have a small 2 qt, since I'm only cooking for one. I've never cooked chicken in it. Does anyone have any recommendations on how long I should cook the chicken? Should I use smaller/thinner chicken breasts? I came across this on Pinterest & gave it a try. Because there is a lot of juices when its finished, I added some Philadelphia Cooking Cream. Delish & super easy! This was soooo good! I served it with freshly made flour tortillas, pico, avocado, sour cream, cheese, and black beans. The next day I made a tortilla soup out of the remainder. It was better than my usual recipe! If I use frozen chicken breasts do I need to increase the cooking time or reduce the amount of salsa that I put in? I didn't....I actually ended up using more salsa then it says and it still came out great. Just throw everything in together and go. Just cook for 8 hours on low and you should be great. I have made this twice in the week since finding this recipe. I love it sooo much. I made the chicken and that night we would have the taco's(I served ours in hard shell tacos...messy but sooo worth the mess) being that my Hubby and I were the only ones to eat it needless to say there were tons of leftovers so the next night I grabbed some burrito sized tortillas and made chicken burritos with the leftover mix. It was fantastic. Our local mexican joint makes something called Chicken Taquitos for an appetizer and these are so similar to them that my Hubby said to me "Who needs Tequila's(name of the place)". I took that as the highest form of compliment. So thank you very much for this recipe! Thank you, saw this on Pinterest today, made them and hours later, just ate them~Delicious! I need a good recipe for leftovers? maybe a good tortilla soup or another idea of something good, i have sooo much left? I used this idea of the crock pot chicken but used homemade salsa and homemade taco seasoning. So technically it was quite a few more steps than the three ingredients. But there is something so worth the extra time in making everything from scratch. Thank you for posting this, I made this for my boyfriend and he LOVED it. Anonymous, I froze a big bowl of it for later. You can make a taco lasagna..just use shredded mexican cheese and layer it with the noodles and sauce. I have it on cooking right this minute! My crockpot is oval and I was a bit worried about the moisture so I added some diced fire roasted tomatoes and a bit more seasoning. *fingers crossed* to it turning out as well as everyone has said!!! I added a can of cream of mushroom soup! Delicious! Could someone who LOVED this tell me what brand of salsa they used? I imagine this will affect the taste quite a bit and I usually don't buy salsa, just always make fresh pico or my own salsa. But I'd love to buy a few jars to keep on hand for such an easy recipe. Thanks! Note: I wish I hadn't added the extra can of fire roasted tomatoes... It's entirely too liquidy... I'm currently trying to cook some of the liquid off!!! Do u just throw raw chicken into the pot? And it can be frozen? Made this for dinner tonight- had a bag of defrosted chicken tenderloins, bottle of pace and packet of low sodium taco seasonig. Put it in this morning before I went to work and came home to a yummy selling home. Everyone loved it. Is there a good recipe for tortilla soup for the left overs? Made it tonight and it was a hit! Thank you so much! Found the recipe via pinterest. i found you on pintrest! love everything im seeing :) ... ive got this in the crock now, while im at work !i didnt have the taco pack so i just added some of the seassons i had, hope it turns out good! so you don't have to add soup or anything the salsa and seasoning is enough poured over the chicken in the slow cooker? How much will the 6 peices feed? I used 4 breasts and it can feed about 8!! These were fabulous, healthy, easy and my home smelled amazing!! Thanks for sharing!! I have this on right now! Smells so good! Do I take the chicken out of the sauce to shred and use? Or do u shred and leave in sauce and use sauce too? Just shred it in the sauce! That'll help the sauce incorporate into the chicken even more. Enjoy! I have been wondering what to make as my "main dish" for my Super Bowl party and..TA DA, this is it!! Given all the other apps I'm making, this will be so easy. I can't wait to make it and see what people think.